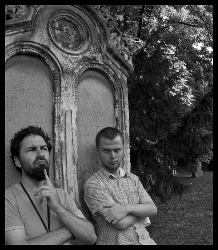 Metrom is a dark music project from Bratislava, Slovakia, founded by Nenad Branković and Michal Tornyai. In summer of 2007 they started to experiment with new musical ideas. In 2008 they self-released a CD-R EP Atra Dies with two additional tracks by related musical project Yspotua. After a few successful live performances in Slovakia, Czech Republic and Germany they had a two year hiatus. In 2011 Metrom was reborn.